With the release of Lightroom Beta 4 and Aperture 1.5, I felt it was time to check in with these two premier applications to see how they were evolving. Back in January, I published Lightroom vs Aperture round 1. Today we go at it again. Much has changed in 9 months. Lightroom is now available for both Mac and Windows. 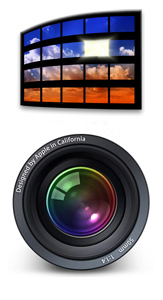 Aperture runs in Intel-powered Macs as well as PowerPCs. Lightroom's Develop module has grown up into one of the most elegant image editing tools I've ever used. Aperture's performance has improved dramatically, to the point I can do serious photo editing on my 17" MacBook Pro without the need for a desktop computer. There's lots to discuss, so you might want to spend the next half hour with me as we explore the highlights of these two revolutionary applications. Now that I've piqued your curiosity, it's time to listen to today's audio show titled, "Lightroom vs Aperture Revisted." You can download the podcast here (31 minutes). Hey, I just wanted to say what a good website. I thoroughly enjoyed it and found it interesting reading. Anticipating your next post!